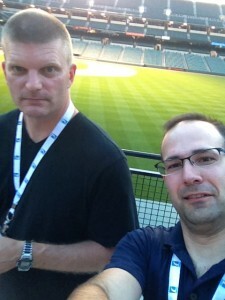 Rob and Erik at Camden Yards in Baltimore. Recorded at the American Orthopaedic Society for Sports Medicine (AOSSM) annual conference in Baltimore, Episode 9 is my sit down with Rob Manske. Rob is an assistant professor in the Department of Physical Therapy at Wichita State University and the current vice president of the Sports Section of the American Physical Therapy Association (SPTS). Not only is Rob an excellent teacher (winner of the Kansas Physical Therapy Association “Educator of the Year” award and the SPTS “Excellence in Education” award) he also spends a few days every week in the clinic treating patients. For more information on Rob you can go to his bio on the Wichita State University website. Rob is the editor of several wonderful textbooks on physical therapy and can be purchased through Amazon. Previous story Sports Health Journal now in PubMed!! !